I may have just done a Team Fortress 2 comic, but with the Mann vs Machine update newly released I couldn't not-do a comic about those beautiful new upgrades! 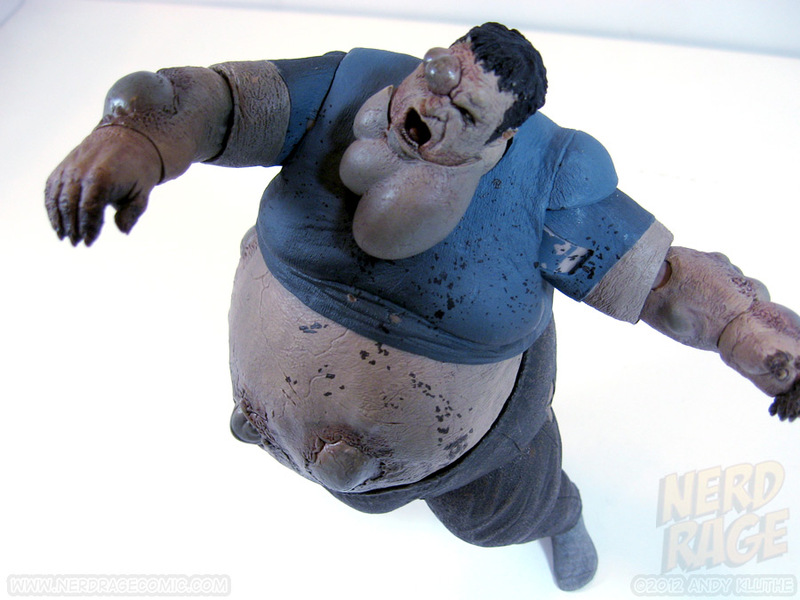 Skip down below for a review of NECA's Deluxe Left 4 Dead Boomer. Be sure to check out my latest comic for Dorkly! It's the end of an era: Nintendo has announced Nintendo Power will be going out of print. This stirs up a lot of feelings in me. I grew into a gamer through a healthy diet of Nintendo. We had an NES, handed down from my uncle, then got a Super Nintendo for Christmas. We each had a GameBoy. There was no Sega in this household (much to my brother's disappointment every Christmas). The Mushroom Kingdom, Zebes, and land of Hyrule were my stomping ground. Print magazines are all but obsolete in an era of internet connections. News breaks faster on the web than it will ever break in print, and even babies use computers today. I was too young for the internet during my early years of gaming, and even after I began using it, it seemed to be mostly an ocean of rumors trying to convince me I could play as Luigi in Mario 64 or could push the truck in Pokemon if I beat the Elite Four 256 times. Magazines still had a place in the world. I distinctly remember reading about Pokemon in Nintendo Power -- for a few issues they ran a smaller magazine that would make Xzibit proud, neatly attached to the inside of the book by a series of perforated pages. I remember scouring those pages and knowing this would be something I needed to play, needed to watch, needed to buy. My hats off to you, Nintendo, I took the bait hook, line, and sinker. I was talking about Pokemon before my classmates even knew what it was. At garage sales and used game shops I'd pick up back issues of Nintendo Power. They were old, but they were still fun to read. Sometimes they covered games I had in my collection, or had maps that were useful. Sometimes it was just fun to browse through the letters. Others included awesome comics, like the series they ran for Super Metroid or Star Fox. I haven't been a subscriber to Nintendo Power for years now. Tips & Tricks, EGM -- I saw other magazines die out with the changing times. Nintendo Power is hardly the magazine they started out as, but they kept pushing on. You lived a long life, buddy. I'm sad to have to see you go. 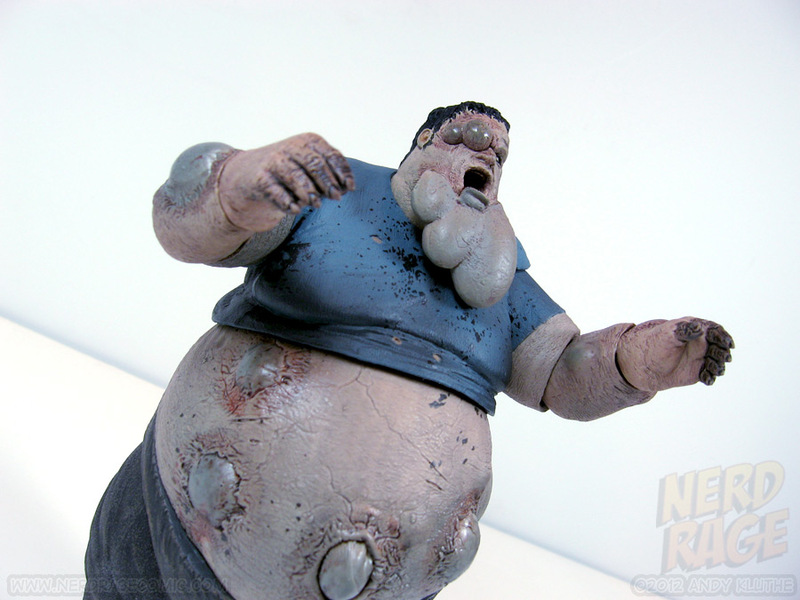 This week the toy reviews return, this time with NECA’s Deluxe Left 4 Dead Boomer. To begin, I have no packaged shots of this one, if that's your thing, but he comes in a standard NECA clamshell. Ya know, those annoying plastic prisons you have to bust the scissors out on. He's secured in his plastic inlay by a couple twist ties. If you really want packaged shots, I’m sure your local Toys R Us has plenty of NECA figures in stock (or you could look online, like a normal person). I’m of the opinion toys, even most collector’s items, are intended to be taken out of the package and enjoyed. The boomer is quite heavy, solid plastic. You’re probably getting your money’s worth in plastic alone. He’s a little over six and a half inches tall, so he's a little big but should mesh pretty well with the rest of your 6-7 inch figures. Paint apps are nice, in typical NECA fashion, they have a variety of washes, dry brushing, and other effects. 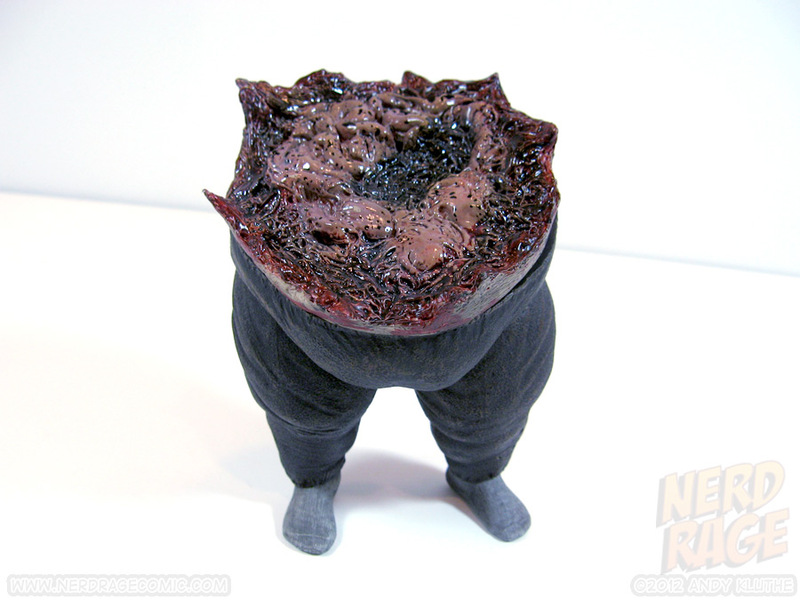 The attention to detail really brings out the texture in this fellow’s grimy, eroding skin and elastic-waisted pants. Because the sleeves are painted on to his upper arms, if you lift his arms too high you will see exposed ‘skin’ (gray-ish plastic) in his armpits. I don’t know if this varies from figure to figure, but both arms are that way on my figure. The boomer is light on accessories, including only his disgusting, alternate severed waist (which is a cool inclusion). 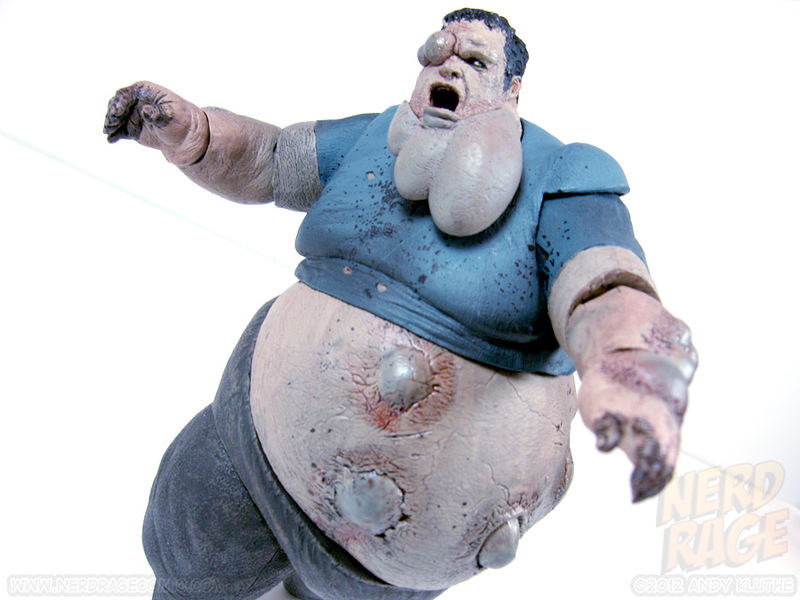 I don’t know what else an obese zombie really needs. A stream of his own vomit, maybe? On to articulation -- the real clincher. NECA’s articulation varies from figure to figure. Some are practically statues. Some are...fairly poseable. From what I can tell, NECA sculpts their figures then adds the articulation which sometimes leads to interesting results. I’m probably spoiled by some of the super articulated stuff from Japan (Figma, Revoltech, Figuarts, etc.) which seems to have a great deal of thought put into how individual pieces will fit together. So I was pleasantly surprised by the boomer’s articulation. Keep in mind, you won’t get a whole lot out of his lower body. 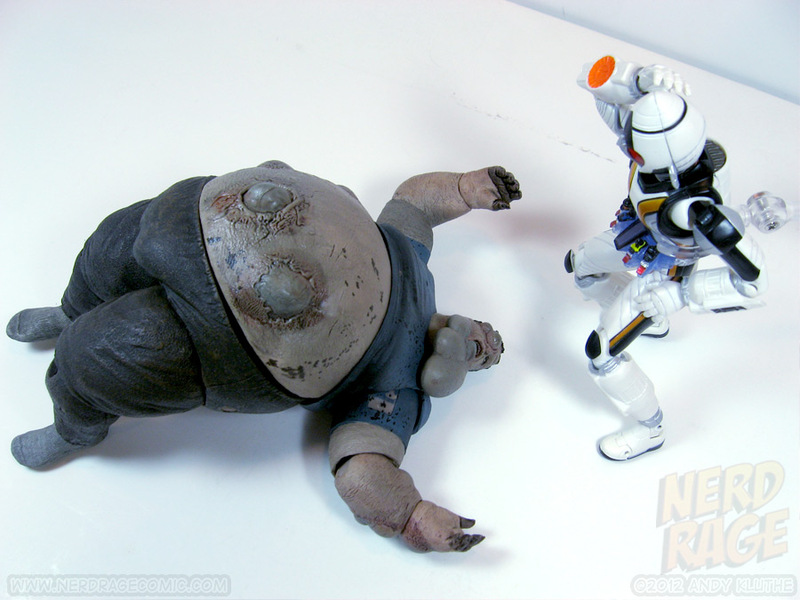 His stomach folds keep his hips from getting too much forward motion, but I was very impressed with what NECA got out of this guy. The shoulders are a swivel hinge, elbows are swivel hinge, and wrists seem to be some type of ball joint but you won’t get much range from them. 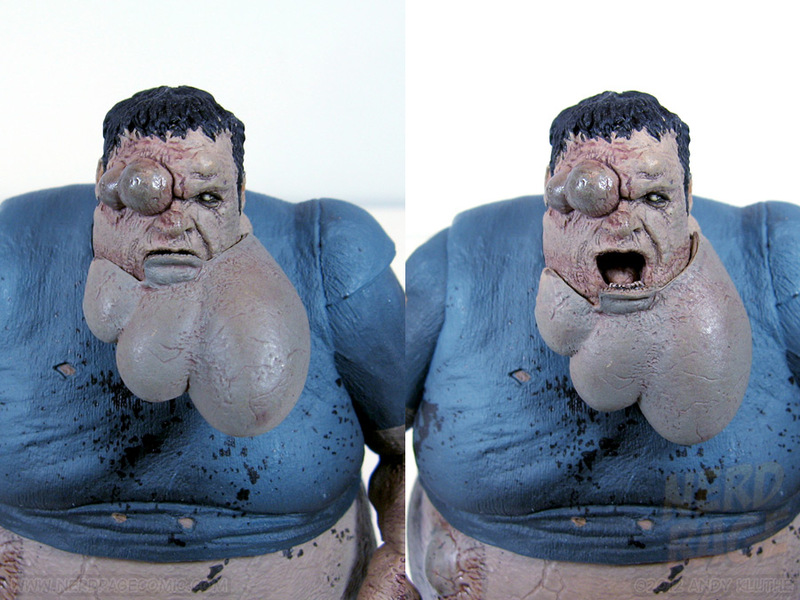 The goiters on his neck are rather ingeniously sculpted as part of the chin and set on a hinge -- so he can actually open and close his mouth! The neck is a swivel cut joint EDIT: Turns out my joint was locked up, the neck also has some type of ball or hinge. So yes, the Boomer can look up and down. The chest is connected by some sort of ball mechanism or hinge of some kind that I can’t see; he can lean back a little and gets a little side to side motion. The chest also pivots. 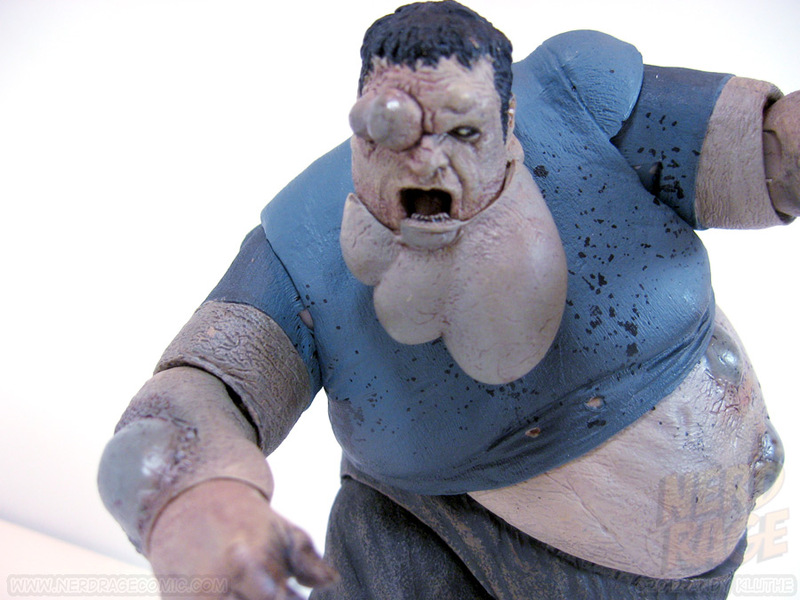 His stomach connects to the waist with a peg, so that swivels and also leads to the use of his one accessory: you can disconnect the upper body and swap it with the exposed guts piece, recreating his ‘asploded look. 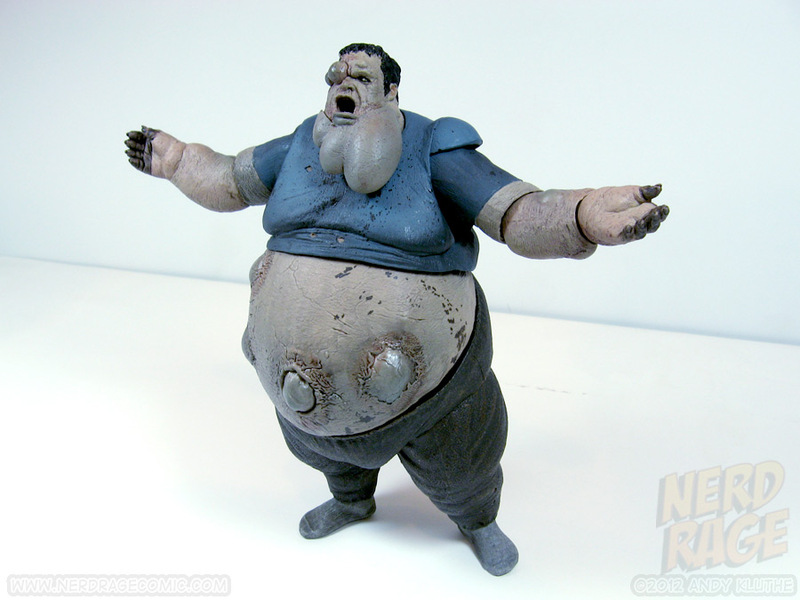 The hips are ball joints but, again, hindered by his plastic rolls of fat. The knees are swivel hinges and the feet feel like a ball joints, but you won’t get a whole lot of range out of those, either. Due to the heavy nature of this figure, you'll mostly want to keep him with both feet on the ground. Or rather, you don't have much choice. 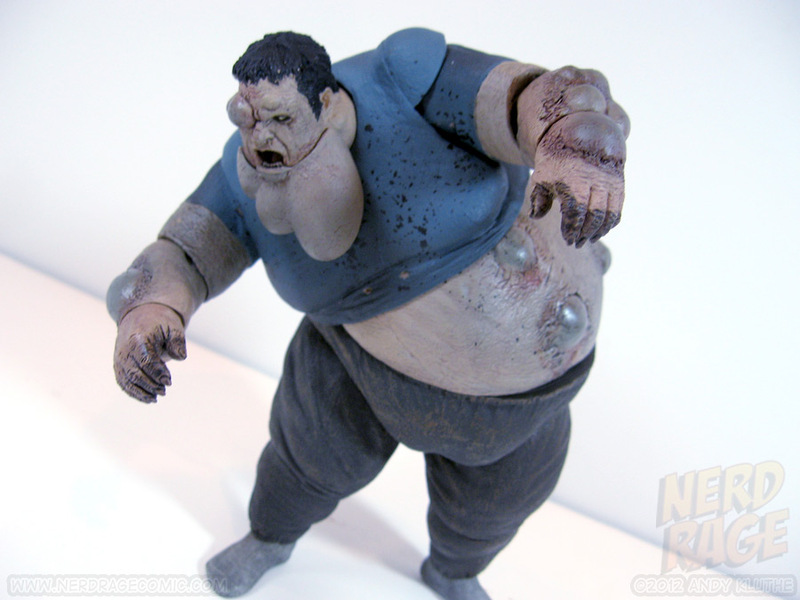 His feet do include peg holes, so there may be stands available that can support this super-sized infected in some fancier poses-- otherwise, though, you’ll be sticking with upright posture. Overall, I’m very pleased with him. If someone from NECA is reading this, keep up the good work, it's nice to see you guys pushing articulation. At $23, his price tag is a little higher than their usual fair, either because of the sheer size of him or the Valve licensing. Either way, this is a great, disgusting piece. 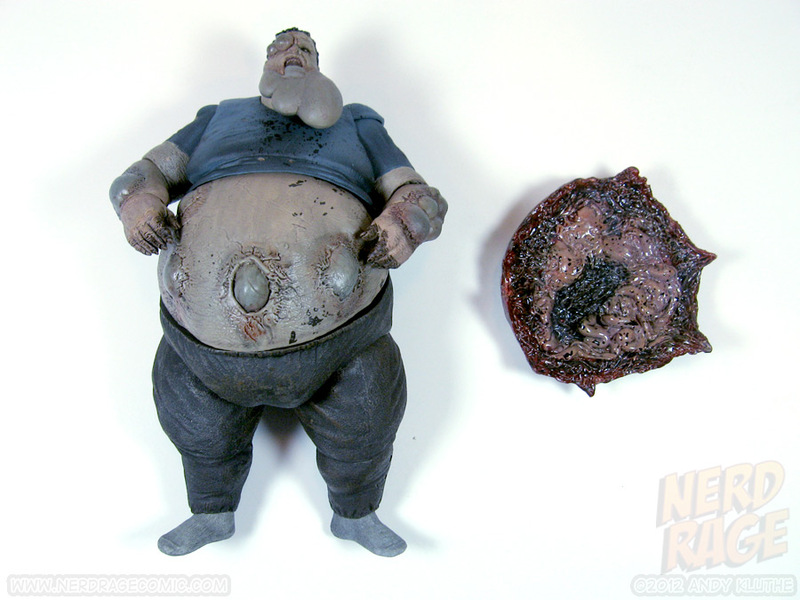 Some boomer bile would’ve been a nice pack-in, but I’ll settle for his exposed guts. 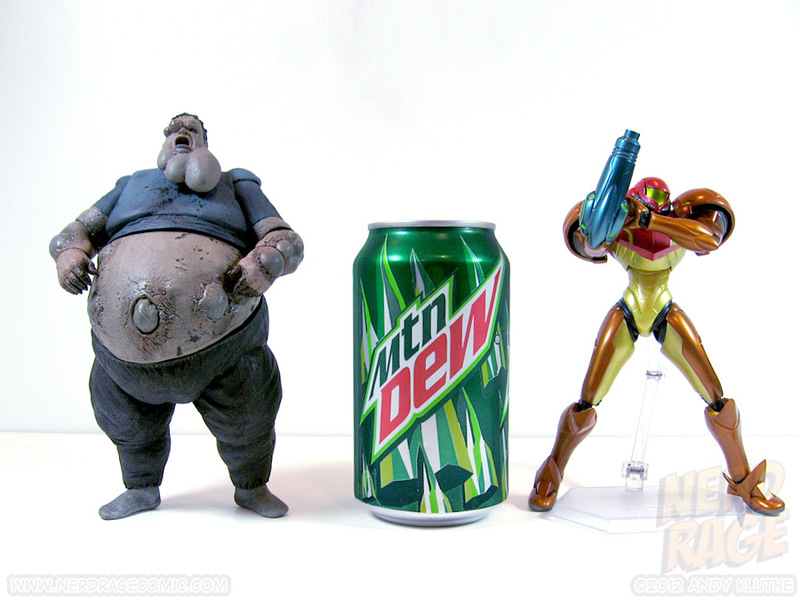 Now hurry up with those TF2 figures, NECA! I keep throwing money at my screen, but nothing is happening!